A recent report from Net Applications shows only 0.11 percent of PC owners are running Windows 8 Consumer Preview since its February 29th release. This week we want to know if you are currently running the latest version of the Windows OS. Some interesting results from a Net Applications report were recently released. It shows only 0.11 percent of PC owners are running Windows 8 Consumer Preview since its February 29th release. This isn’t too surprising considering it’s still in beta. We also don’t know how many users will latch on to the Windows 8 tablets when they arrive on the market. What is surprising, according to the report, is there are still more users of Windows 2000 and NT than Windows 8 – though only by a small margin. According to our own poll on February 15th, out of 890 votes, 82% of you said you were counting down the days until the February 29th release of Windows 8 Consumer Preview. Remember it’s completely free for anyone to download and test out. While we certainly don’t recommend using Windows 8 Consumer Preview on your main system, there are other ways to test it out. We have articles showing the following. Our question this week is – Are you currently running the Windows 8 Consumer Preview? Vote, then leave a comment and join the discussion! Running Win8 as a dual boot. I have customised every possible customisable bit I can to suit my taste without taking away the fact that it is Windows8, (Wont add third party Start Menu’s – anyway you can add a Start menu to the taskbar using the built in tools.). Impressed with many of the features but dont like just as many as well. I dont think I will be rushing out to upgrade when its RTM but who knows, opinions change. I agree with you on that one Alan. I don’t use the start menu even on Windows 7 so I don’t mind that it’s gone now that I’ve figured out the shortcut keys for search. I’m running windows 8 on an older laptop and so far so good. It only has 2 gigs of ram yet it’s still zippy and works well. It still feels like a service pack to Windows 7 so I’m looking for more features to be released to justify the upgrade. Sounds about right. Other than the highly debated metro skin, there isn’t a lot going on that Windows 7 didn’t already have. I also don’t see any reason why the Windows Apps Market couldn’t be integrated with Windows 7 via a service pack release. To say Metro is just a skin is a massive understatement, it’s a new User Interface built-in to Windows 8 and the Metro applications are built using WinRT which is at the core of Metro applications and what the Windows Store provides. 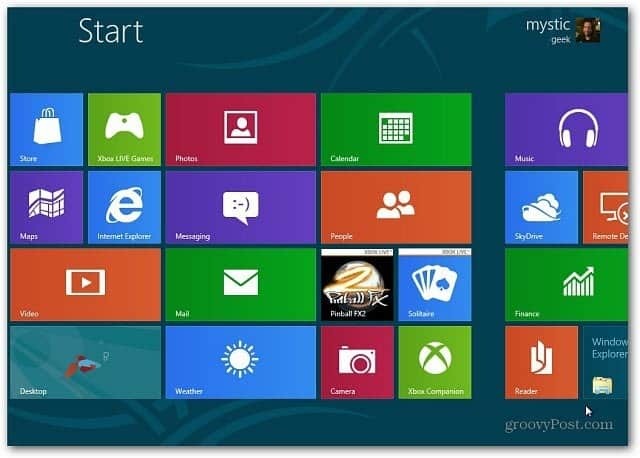 WinRT (Windows Runtime) is a new programming model that is new to Windows 8. If the Windows Store was available in Windows 7, all the applications you downloaded would not work because WinRT is not available on Windows 7. Of course we’re running it here through various means so we can get out as much quality information for the readers. I have even run it on an older P4 system and it worked surprisingly well. That being said, it is still not on my main production system. Windows 7 works quite well for that. I have gotten used to not having a “traditional” Start Menu. The Windows Key and other Windows 8 shortcuts have become my best friend using it on a desktop PC. Although I am a big fan of the Stardock Start Button alternative. I have also been using it on a Dell Duo with a touch screen, but don’t find the Metro UI particularly increasing productivity. Using the Desktop on a touch screen isn’t exactly intuitive either without the use of a Stylus in my case. I am running it as a vm with remotefx , works really well. also haven’t tried setting up ceton tuners yet. @Welchwerks — you’re not seeing your WHS cuz its on a VM? Windows 8 on a tablet, might be interesting.